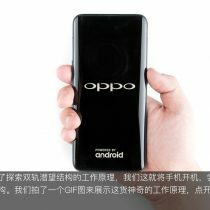 On June 29,2018, OPPO has officially launched its flagship smartphone- the OPPO Find X. 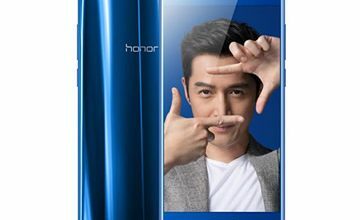 This flagship adopts OPPO Facekey 3D structure which makes it much safer than facial recognition to unlock the phone. 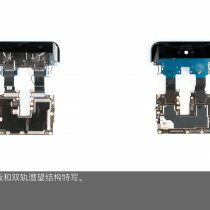 It powered by Qualcomm Snapdragon 845 processor, the phone adopts third-generation AIE technology. 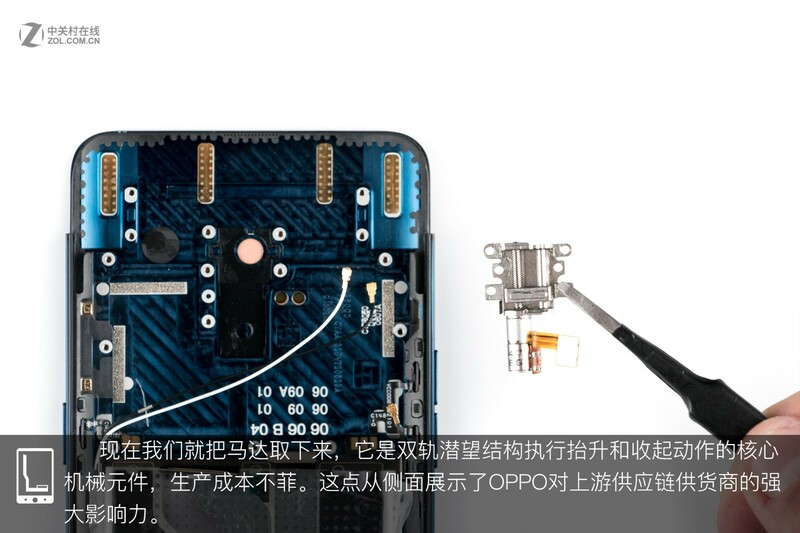 Besides, it supports VOOC technology. 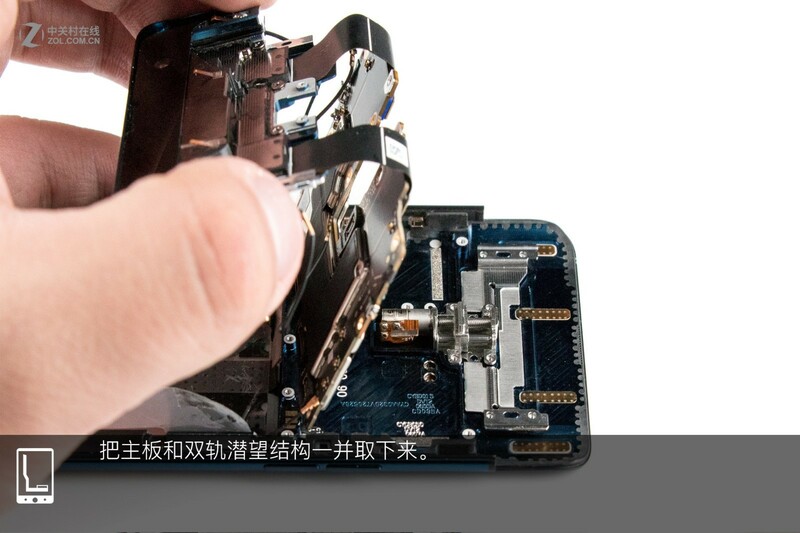 With so much advanced technology, how about its workmanship? 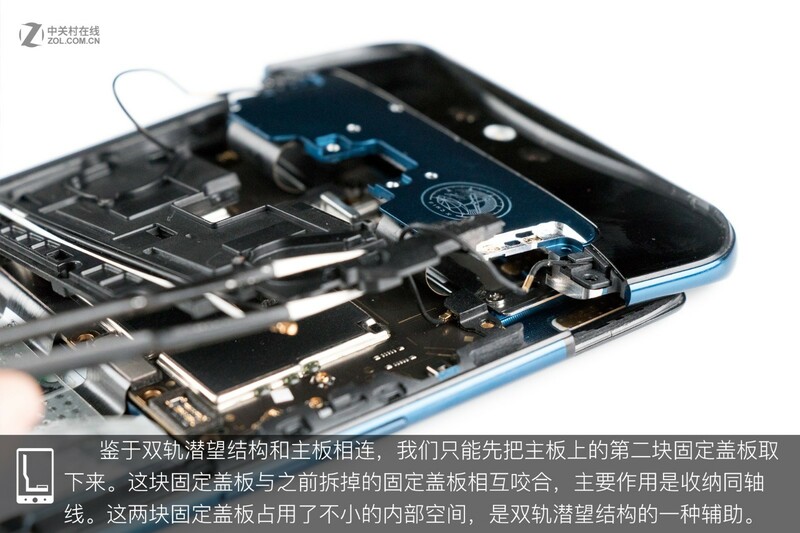 Today, let’s start the teardown of the phone to see its internal structure and workmanship. 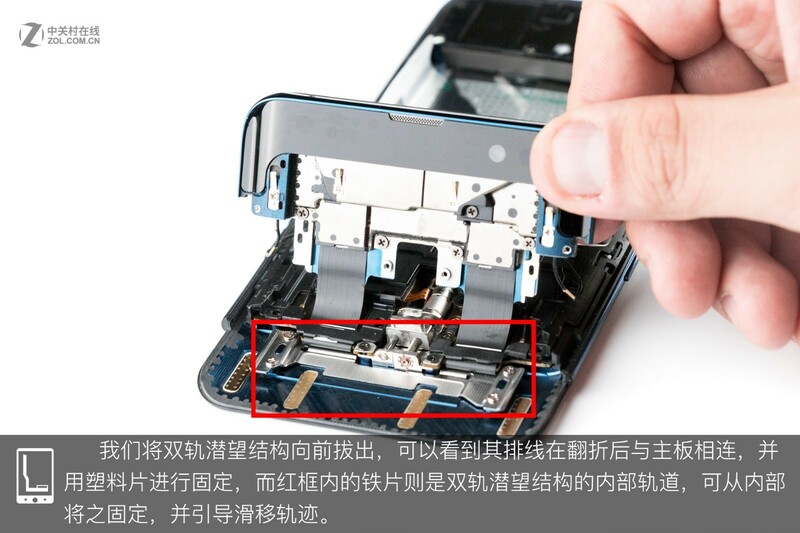 The SIM card tray is designed at the bottom of the phone. Use a clip to take it out. 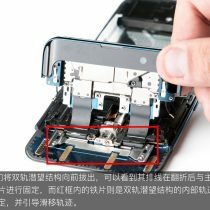 Considering the phone structure, I need to use a heater to heat up the back cover to melt the glue, aiming to make a gap between the back cover and the cushion. I adjust the heater’s temperature to 104℃ and heat up the back cover for about five minutes. 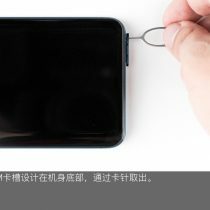 As there is no cable which connecting the back cover to the phone body, I easily separate the back cover from the phone body. 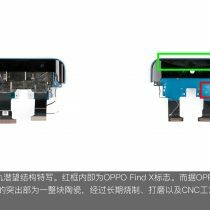 The red part and the green part are in good match, which contributes a lot to the good waterproof and dustproof performance of the top of the phone. 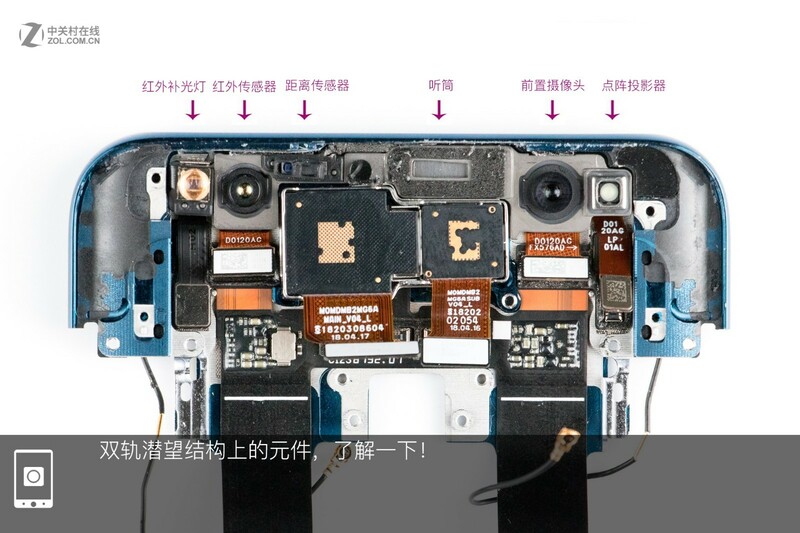 After removing the back cover, we can see that the phone body adopts three-stage design. 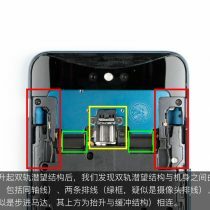 The part circled red is the dual-track periscope structure. 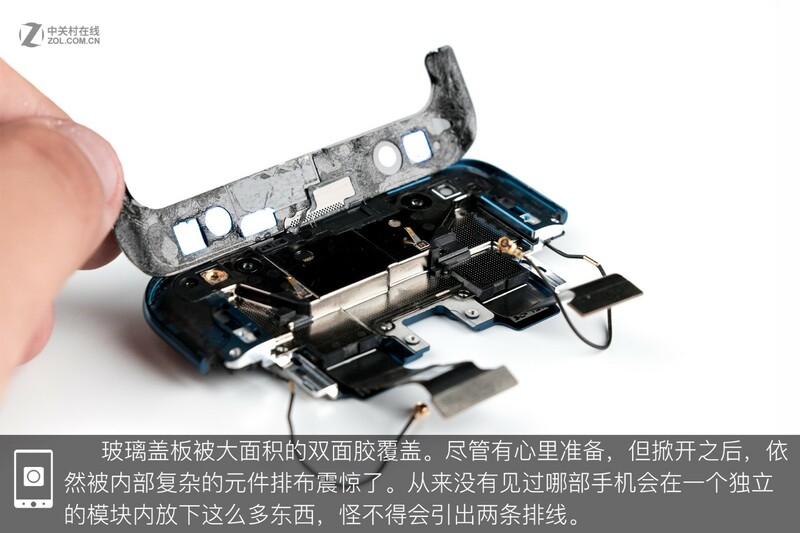 To figure out how this structure works, I turn on the phone, trying to get it worked. This is a GIF image which fully displays the process of how the dual-truck periscope structure works. When this structure works, we can see block part circled red, a motor circled yellow, and two cables circled green. 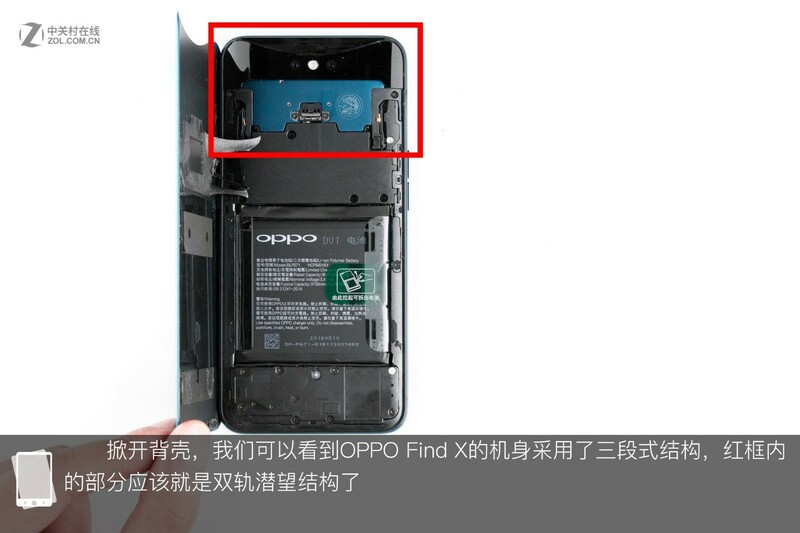 We can see the cover plate can be embedded into the cover plate at the bottom. 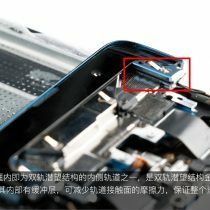 The foam in the part circled red can function as a cushion. 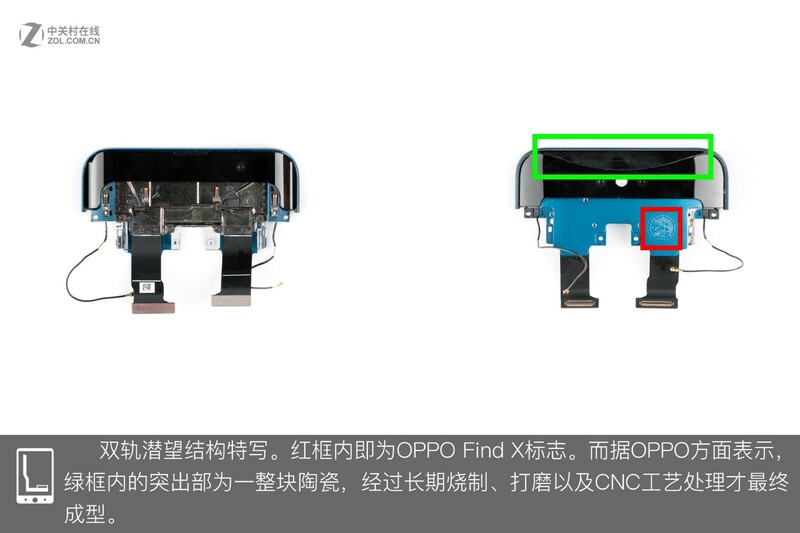 The area circled red reserves for the motion of coaxial cable. 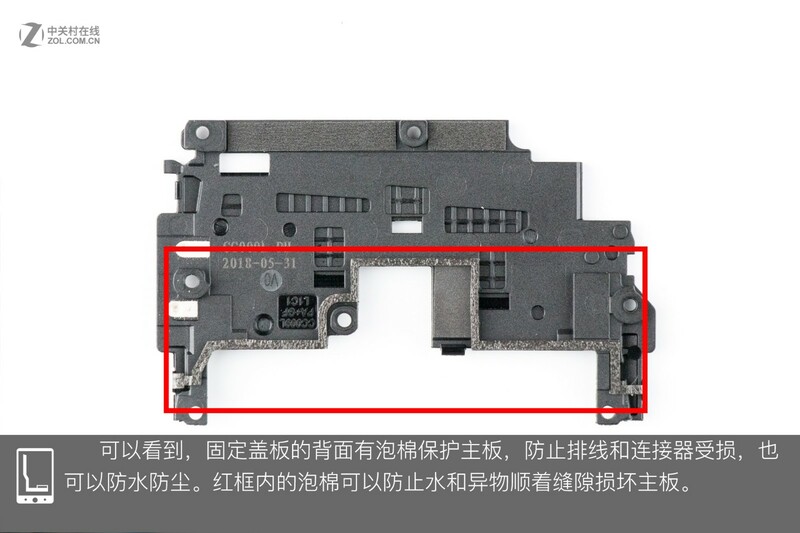 The part circled green is the lower part of the motor and its cable. 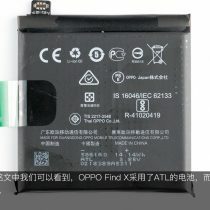 The phone sports a 3730mAh battery. 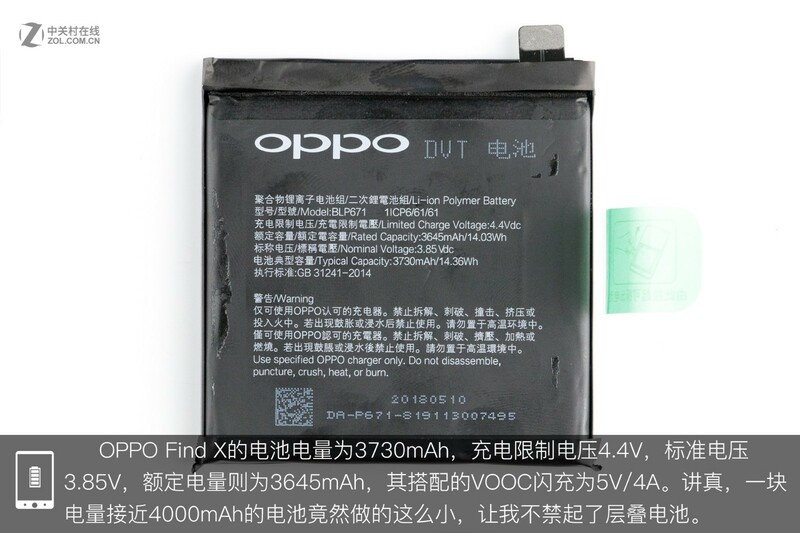 Its limited charge voltage is 4.4V; nominal voltage is 3.85V and rated capacity is 3645mAh. 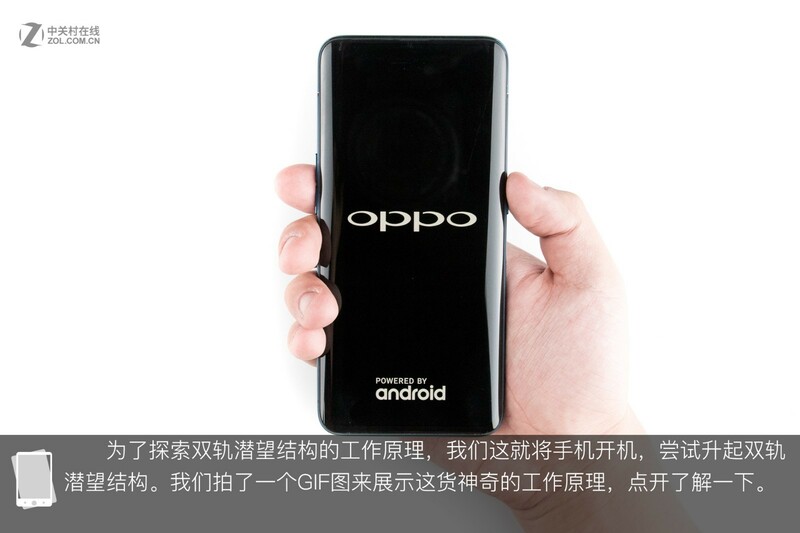 Besides, it supports 5V/4A VOOC technology. 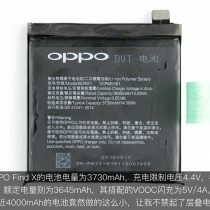 To be honest, it is a surprise for me to see a battery with the capacity close to 4000mAh is in such a small size. 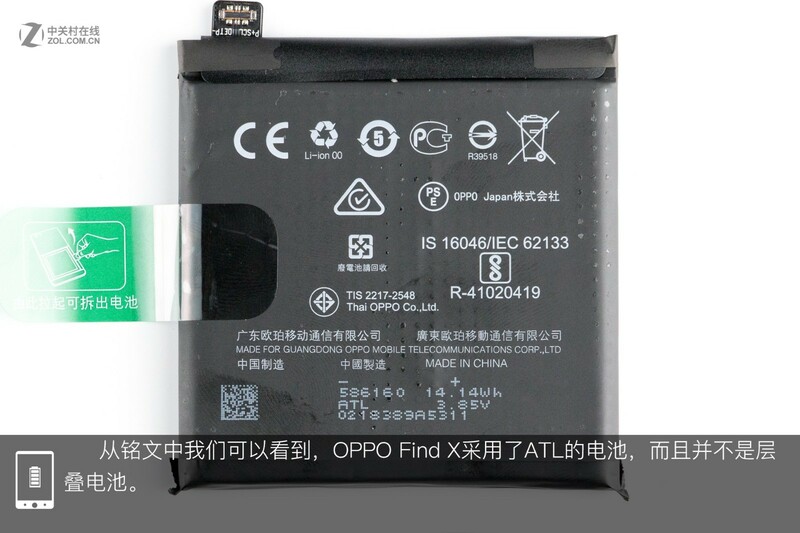 From the back of the battery, we can see that this battery cell is made by ATL. This GIF shows the coaxial cable moves. 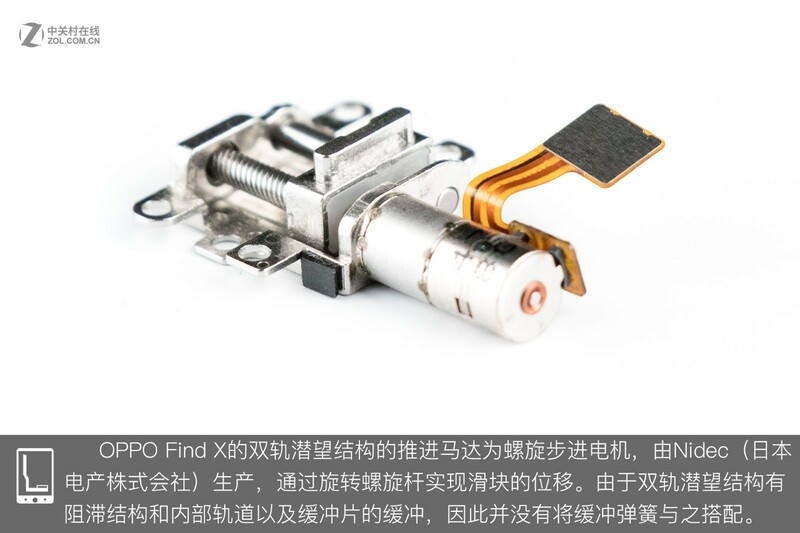 Then, I take out the component between the motor and the dual-track periscope. 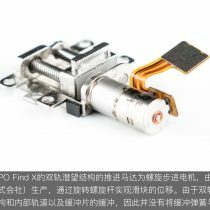 This component pushes the motor to enter the dual-track periscope structure and move upwards or downwards. 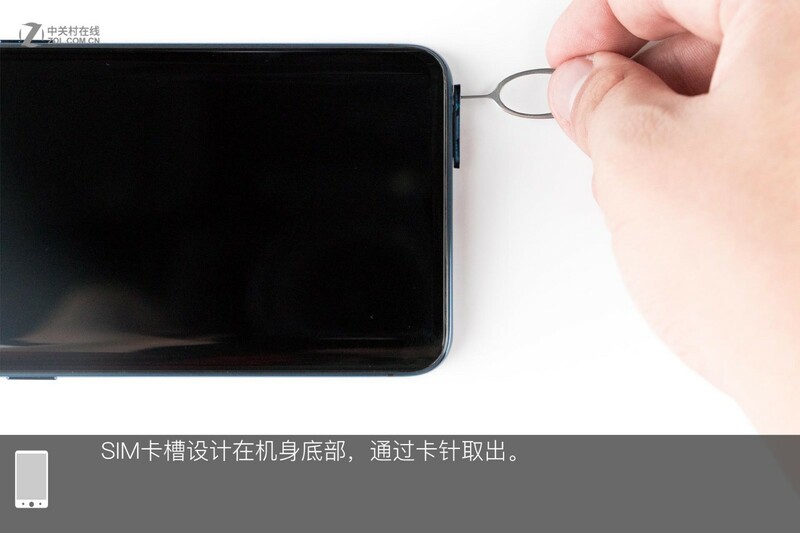 It uses metal and plastic, which can function as a cushion. 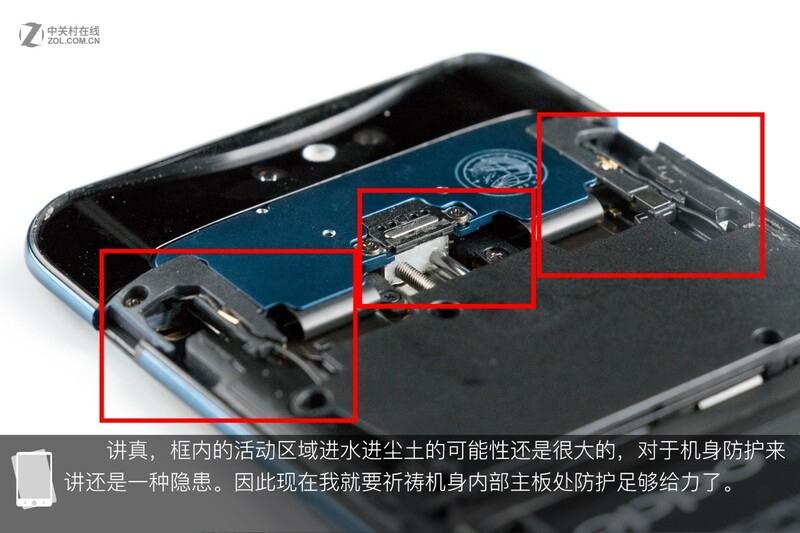 We can see the dual-track structure’s cable is connected to the motherboard. 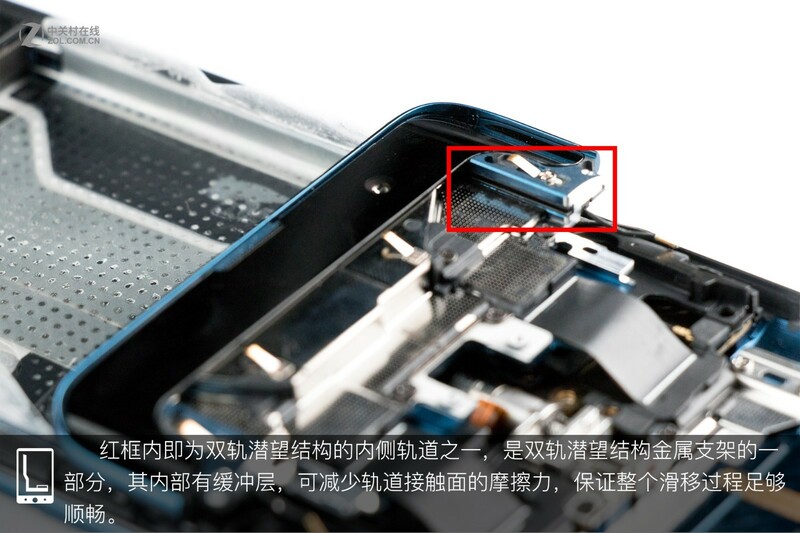 The metal plate in the red circle is the internal track of the dual-track periscope structure. 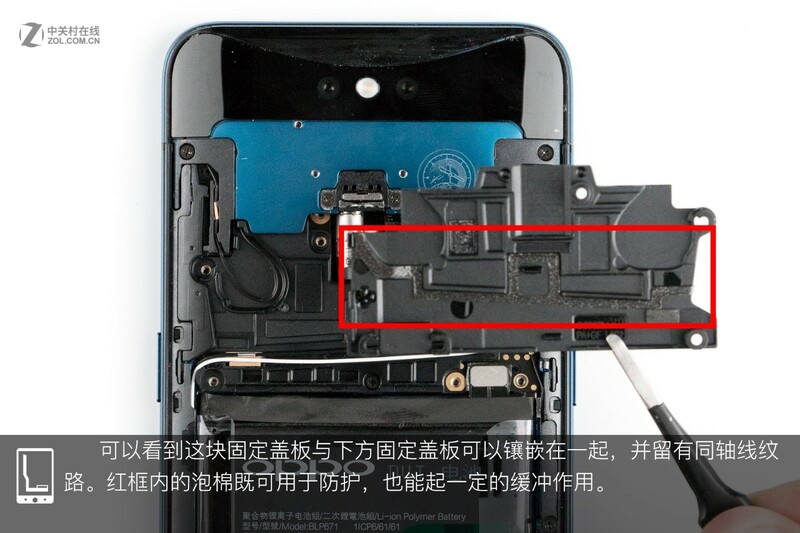 The area circled red is one of the inner side tracks of the dual-track periscope structure. 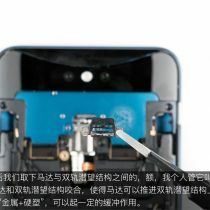 It has a cushion layer inside, which can decrease the friction force between the track and the ground and ensure that the whole gliding process goes smoothly. 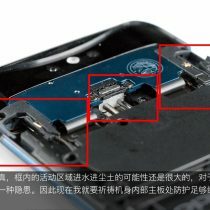 Since the dual-track periscope structure is connected to the motherboard, I have to take out the second cover plate firstly. 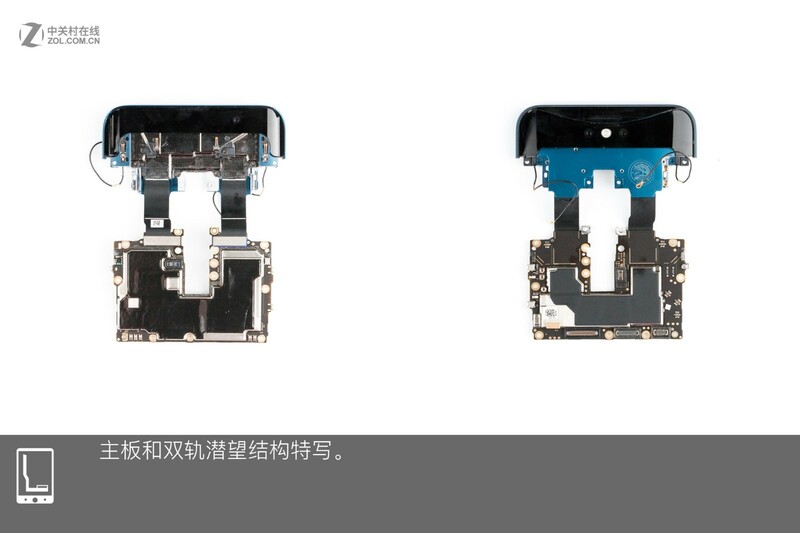 These two cover plates have occupied much room of the internal space, which is of help for the dual-track periscope structure. 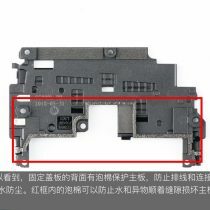 The foam can be seen on the back of the cover plate, and it is used to protect the motherboard, cable, and connectors and prevent vapor and dust from entering. 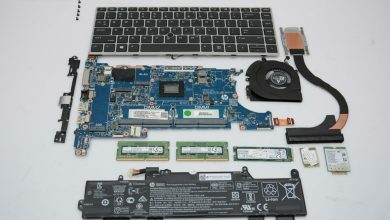 The foam in the red circle can keep water and other materials from causing damage to the motherboard. 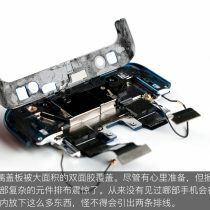 Next, take out the motherboard and the dual-track periscope structure. 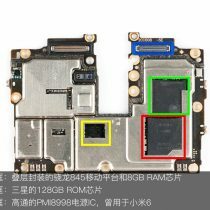 There are the motherboard and the dual-track periscope structure. 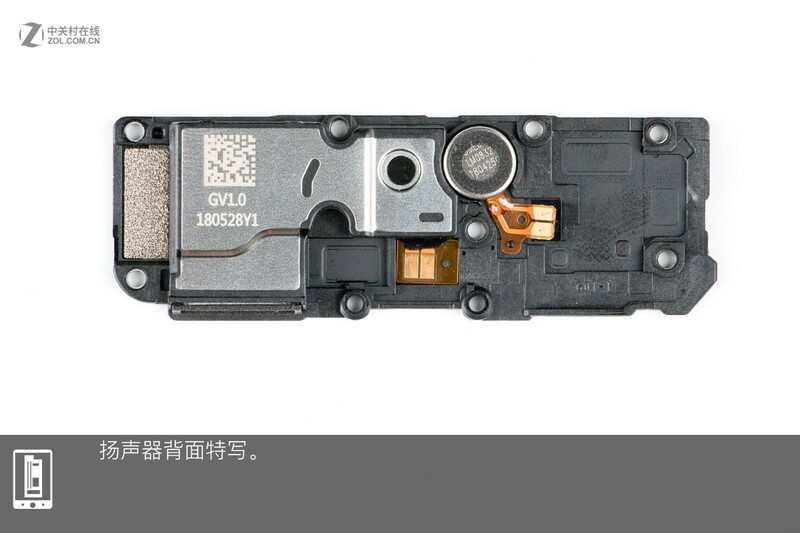 Now, we take out the motor, which is core component of the dual-track periscope structure and it is expensive. 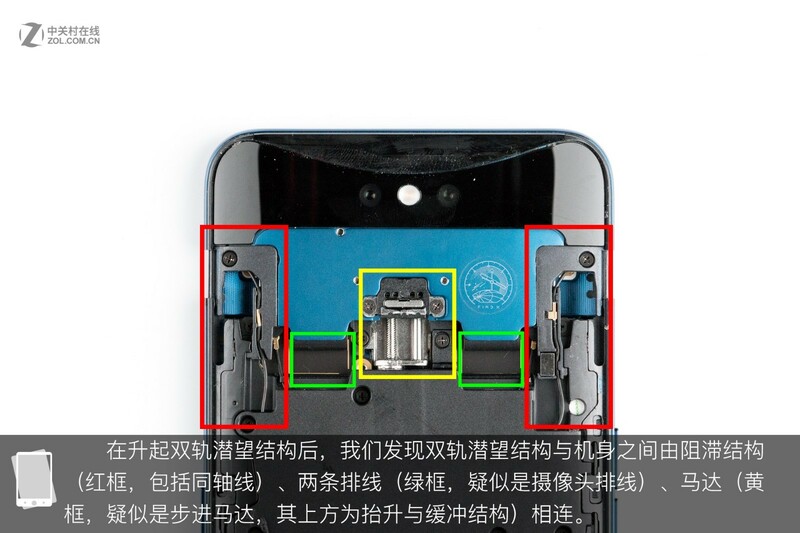 The phone’s dual-track periscope structure is driven by the screw stepper motor. 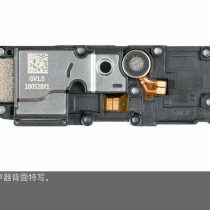 This motor is made by Japanese Nidec. 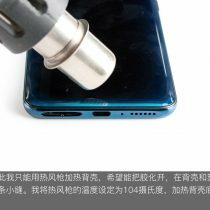 The rotary screw rod can keep the slider move. 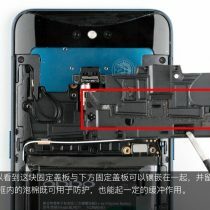 The dual-track periscope structure doesn’t use spring since it has a component function as a cushion. This is the dual-track periscope structure. 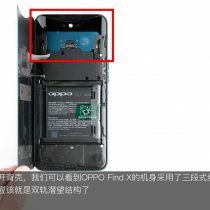 The part circled right is the symbol of the OPPO Find X. 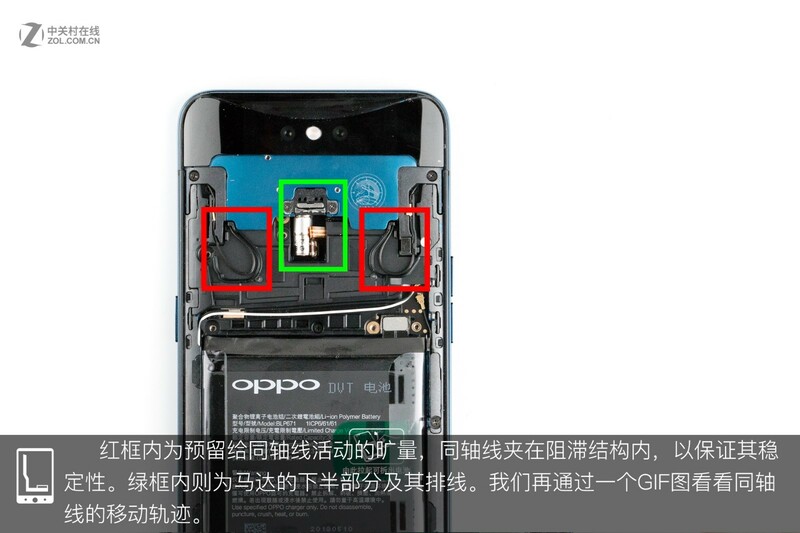 According to OPPO official party, the ceramics circled green is made through a long time via CNC processing. 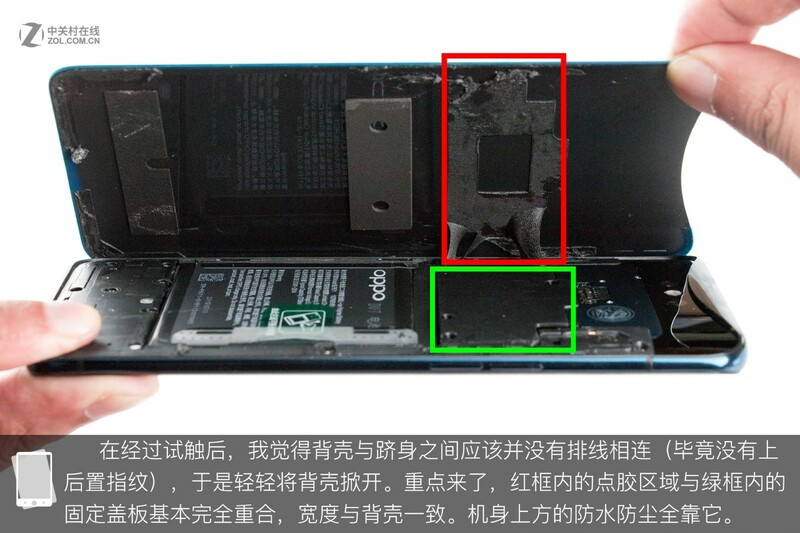 Most of the glass cover plate is covered by double-sided tape. 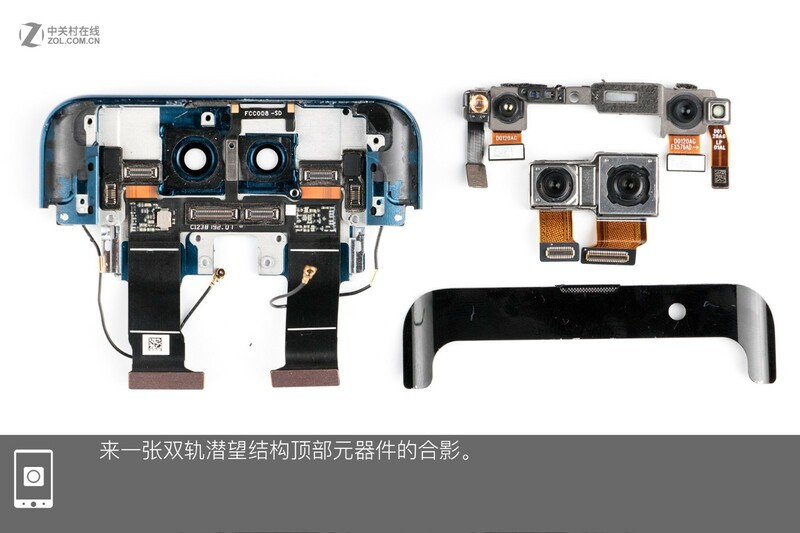 After uncovering the tape, I am amazed by its complex component layout. 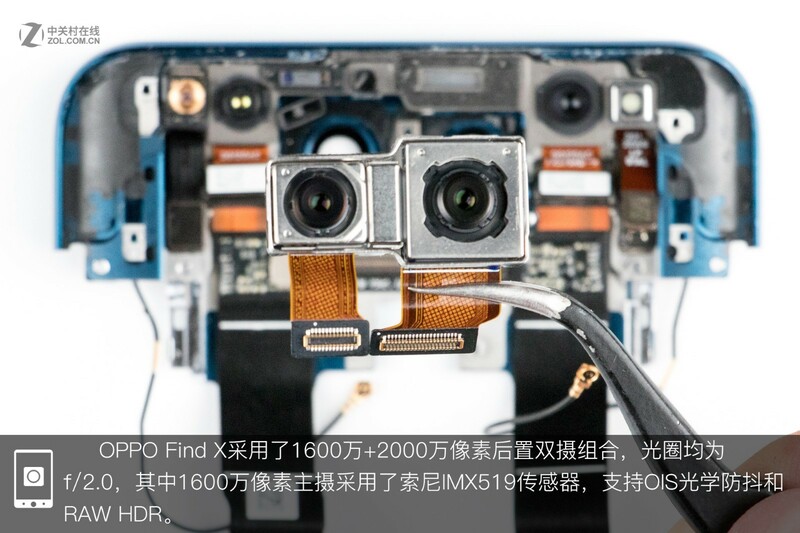 The components on the dual-track periscope structure include infrared LED, an infrared sensor, proximity sensor, earphone, front camera and dot projector (from left to right). 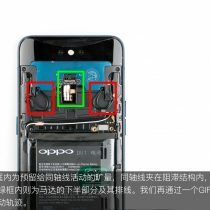 The OPPO Find X features the F/2.0 16MP and F/2.0 20MP dual-rear camera setup. 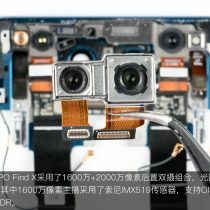 Besides, the 16MP main camera uses Sony IMX519 sensor. 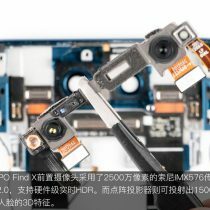 It supports OIS and RAW HDR. 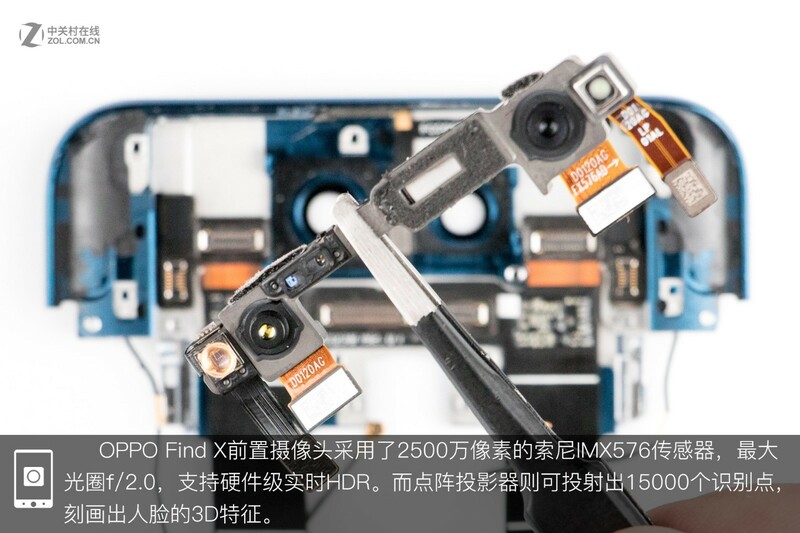 The phone comes with a F/2.0 25MP front camera (Sony IMX576 sensor), and it also supports HDR. This dot projector projects 15000 invisible dots onto your face to build your unique 3D facial map. These are components on the top of the dual-track periscope structure. 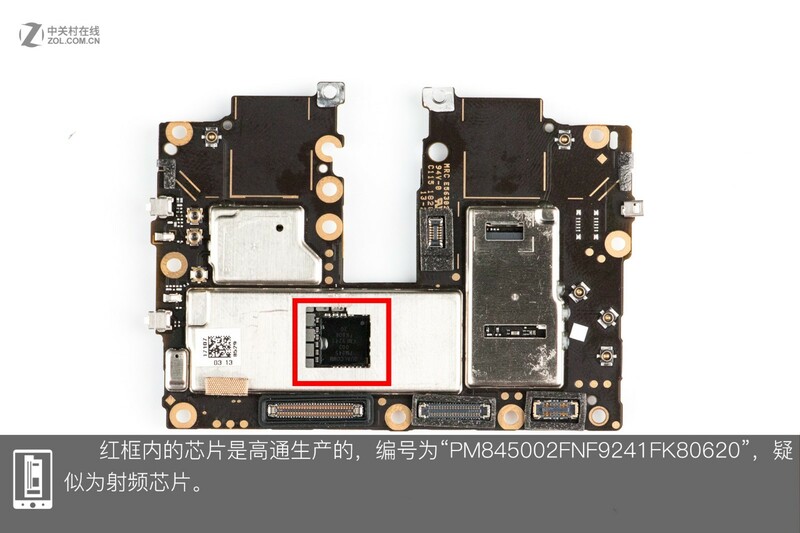 The chip in the red circle is made by Qualcomm, and its code number is PM845002FNF9241FK80620 RF chip. 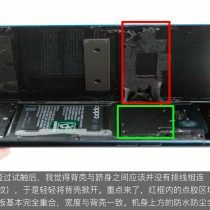 The red circle is Qualcomm Snapdragon 845 Soc and 8GB RAM. 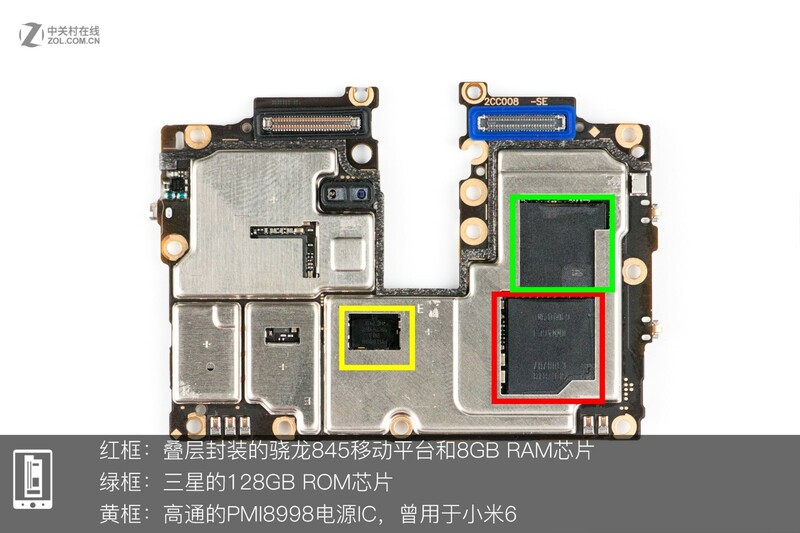 The green circle is 128GB ROM from Samsung. 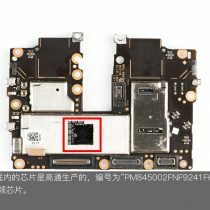 The yellow circle is PMI8998 power IC, which has been applied to the Xiaomi Mi 6. 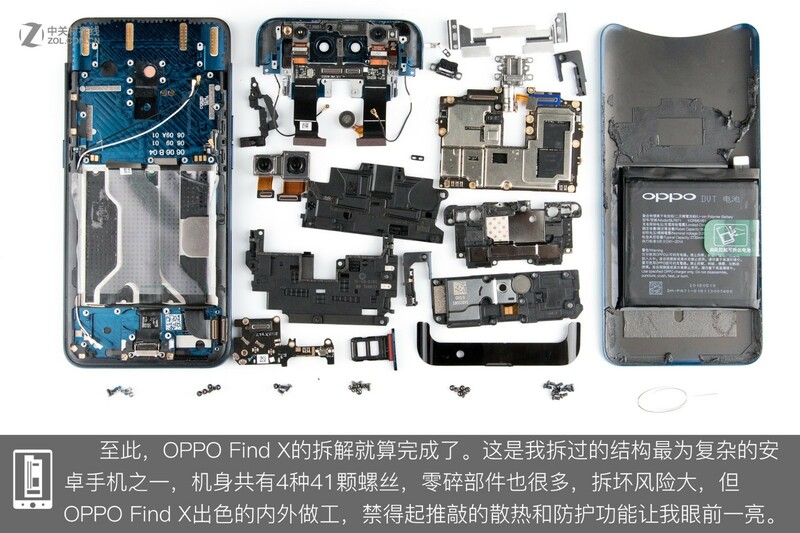 Until now, the teardown of the OPPO Find X is finished. 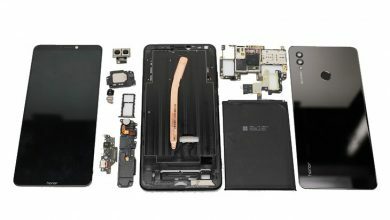 This is one of the Android phones I have torn down which have the most complicated structure. 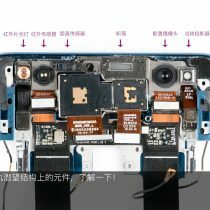 There are 41 screws on the phone body in total and many other small components. 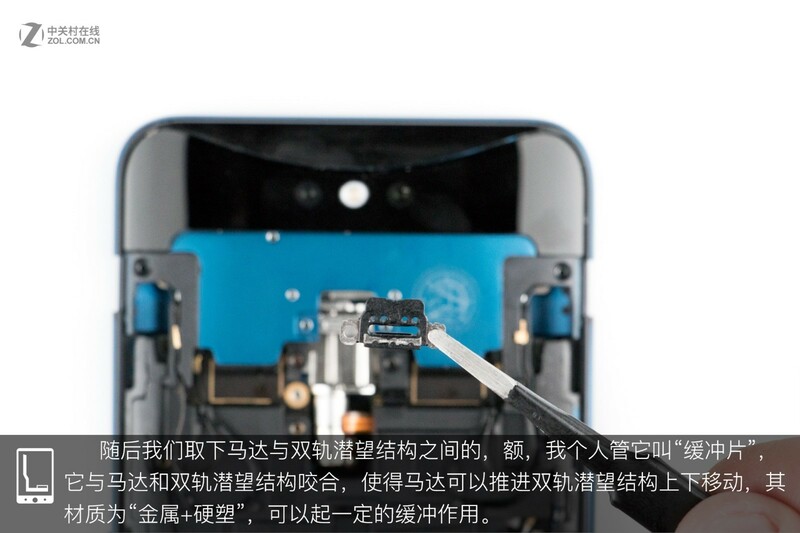 However, undoubtedly this phone has excellent workmanship and good heat dissipation performance. 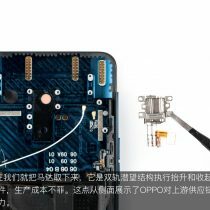 As a flagship that OPPO has released after four years, the OPPO Find X has a creative design and reliable workmanship. 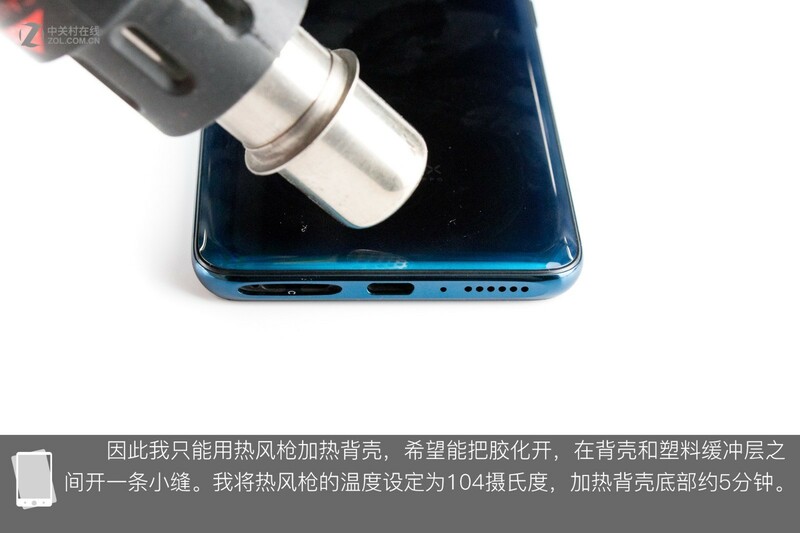 The dual-track periscope design is one of the most innovative designs. 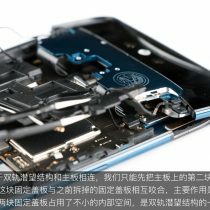 Besides, it is also a durable smartphone. 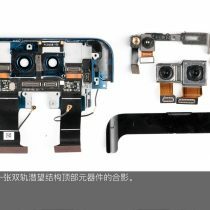 The phone features curved surface glass and complicated internal structure. 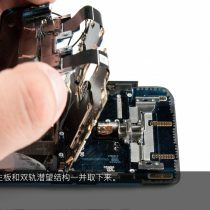 This phone has used many screws with different type and small components. 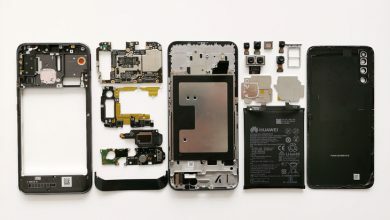 The teardown process of this flagship is also difficult, and the risk of teardown is high.